Find an active weaver colony! If you only have one photo, that is fine! Count all the nests in the colony, including old nests. Some weavers are monogamous and have one current nest, with possibly a few old nests from previous seasons. 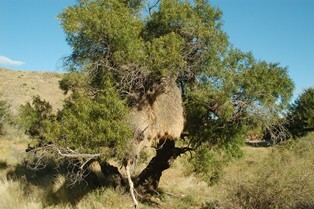 Some weavers are colonial and have many nests in one colony. Try to count all the nests by scanning systematically from one end and walking around, e.g. around a tree or reed patch. Where you know that nests cannot all be counted because some nests are obscured, record the number counted and an estimate in the Notes field and leave the Nest Count field blank. One colony may be situated in several trees or reeds, but if the nests are relatively close together it is one colony. If you are unsure where one colony ends and another starts, look for natural breaks in the nest site. 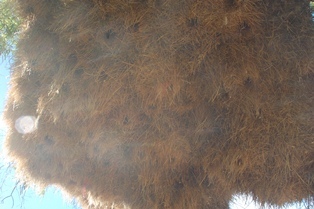 For Social Weavers count the number of nest holes (chambers) per nest mass. If there are two or more nest masses in one tree, add the nest chambers from all nest masses and make a note of the number of nest masses in the Notes. If there are old and new nests, count them all. In the Notes field you can add comments about how many old and new nests there are. Nest site - record the basic site, ie tree (includes bushes), reed (includes bamboo or grass), man made (includes telephone poles or wires, etc), or other. In Notes you can record more specific details, eg tree species, if possible. Breeding active - evidence of breeding includes chicks begging, female incubating (regular in and out flights), egg-shells below the nests, etc. Send colony repeats by counting the nests in the colony on a regular basis (e.g. weekly), especially if the weavers are breeding (ie. evidence of eggs or chicks). Colony repeats provide data on colony changes through a breeding season and across years.